Compare to aluminum, stainless steel is a stronger material used in manufacturing electrical enclosures thus it can be thinner for some applications. 304 & 316 grade stainless steel are the most commonly used among the different classes of stainless steel. The main distinguishing difference between two stainless grades is the addition of an alloy called molybdenum. It greatly enhances the steel’s corrosion resistance, especially if the environment is more saline and it is exposed to chloride. 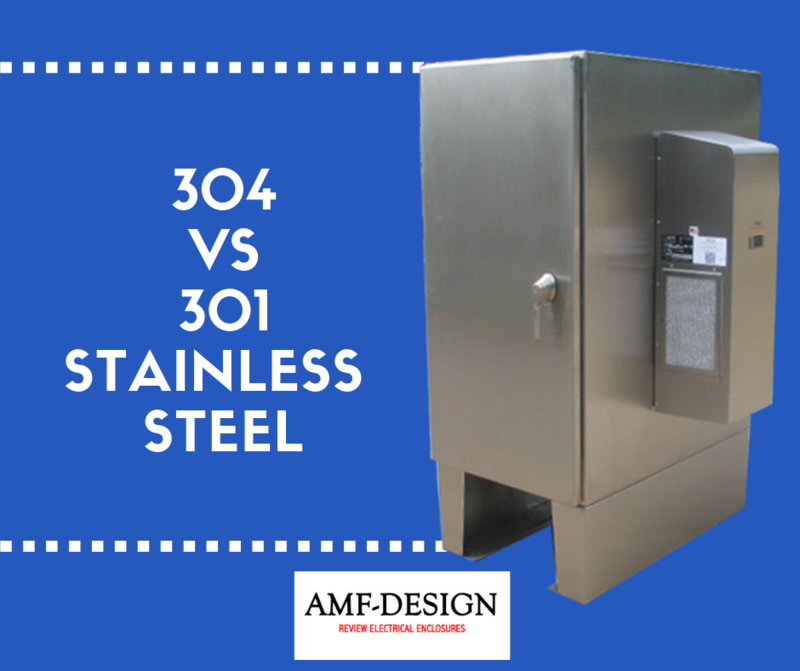 The major difference between 304 and 316 stainless steel is 316 contains molybdenum, the former does not. NEMACO’s Nema 4x stainless steel enclosures uses both 316 and 304 stainless steel rust-resistant alloy. 304 grade stainless steel has a fair to good corrosion resistance while the 316 stainless steel grade contains more chrome and has good corrosion resistance. In addition to this, NEMACO manufactures 316L stainless steel enclosures. It has more chrome and lower carbon which is excellent properties for corrosion resistance. What is 304 stainless steel? 304 stainless steel grade is widely used around the world and is considered as the most common form of stainless steel. Because of its top notch value and corrosion resistance, it is also widely used in manufacturing 304 stainless steel enclosures. Its composition is made of small amounts of carbon and manganese, 35% nickel, and 16-24% chromium. In addition to this, the highly occuring form of 304 stainless steel is the 18-8 or 18/8 which means that it contains 18% chromium and 8% nickel. Electrical enclosures made of 304 stainless steel can withstand corrosion from environments exposed to oxidizing acids. It gives enclosures durability that it needs to harsh environments. In addition to this, this stainless steel grade is also used in kitchen and food applications. It can also be seen in buildings, decor, and site furnishings. However, this material has one weakness: this grade cannot be used in environments exposed to chloride or saline environments because it has a tendency to oxidize and have corrosion. Chloride ions has the capacity to create localized corrosion in the body of the enclosures which is called “pitting”, which can result to 304 stainless steel rust. It can compromise its internal structures because the corrosion can also be formed under the chromium protective barriers. Even a 25 ppm of sodium chloride will have an corrosive effect. What is 316 stainless steel? 316 is a stainless steel grade that is also widely used in manufacturing electrical enclosures second to 304. Like the former stainless steel grade, it has almost the identical physical and mechanical properties and also have a similar composition. The major difference between the 316 and 304 stainless steel is that it has 2-3% molybdenum. This additional element greatly enhances corrosion resistance, specifically against chlorides and other industrial solvents. 316 stainless steel enclosure are widely used in several industrial applications that primarily involves processing of chemicals – especially those environments which have high-salinity exposure such as places near coastal regions and some outdoor areas that has de-icing salts. In addition to this, 316 stainless steel is widely used in making medical surgical instruments. Other 316 stainless steel grades have 7% molybdenum. This enables this particular stainless steel grade with better chloride resistance, though this specification is only necessary if the electrical enclosure is to be used in an industrial applications. 302 – among all grades, this is the most basic type – composed of 8% nickel group and 18% chromium. 309-309S – has an additional nickel and chromium for better corrosion resistance and high temperature scaling resistance. 310-310S – has an additional nickel content higher than the 309309Sto. This minimizes carbide precipitation because of less carbon and it enhances scaling resistance. 330 – this stainless steel grade has ultra high nickel content which gives the best corrosion resistance if exposed to most furnace atmospheres. 347 – 348 – uses tantalum to help tie up carbon and avoid chromium carbide precipitation in welding applications. 430 – is the most ductile and can resist atmospheric condition. 446 – has increased chromium content for about 27% to provide the additional scaling resistance. This grade is regarded as the highest of all straight chromium types. It is important to note that any alloy that contains 30% chromium becomes too brittle for any application. 410 – chromium stainless steel grade which primary purpose is for corrosion and heat resistance. 403 – a special type of stainless steel used for manufacturing blades and buckets in steam turbine and jet engine compressors. 416-416Se – this grade is the variations of 410 which regarded as free machining, nonseizing, nongalling alloys. 420 – chromium stainless steel that can withstand heat treatment and can achieve maximum hardness of approximately 500 Brinell. 431 – a nickel bearing stainless steel grade and can be treated to have high mechanical proerpties. 440C – is the stainless steel grade that can be processed and heat treated to achieve the optimum hardness surpassing any of the stainless steel types.